So, You Hate Your Engagement Ring...Now What? So, You Hate Your Engagement Ring…Now What? In a perfect world, every bride would be as excited about her ring as she is about her engagement…but the reality is, that’s not always the case. It’s certainly a sensitive subject. So, here’s how to navigate when you’re not so happy with your new ring. 1 Figure out exactly what you dislike about the ring. Is the stone too big? Is the setting just not your style? Determining exactly what you like and don’t like about the ring will help you figure out the best course of action. The simplest solution is to have a jeweler re-set you stone in a different mounting; it’s a simple way to revamp the ring. 2 Consider whether the addition of a wedding band will help. Most couples choose their wedding rings together, and it’s a great opportunity to find something you really love. One option is to choose a new ring that you’ll wear in lieu of the engagement ring; many women opt to only wear one ring after they are married, so this isn’t unusual at all. (If you go that route, we suggest moving your engagement ring to your right hand or wearing it on a necklace to spare your fiancé’s feelings.) Or you can use the band to breathe new life into your engagement ring; for example, a blingy wedding band could make your original stone look bigger. 3 Tread lightly with family heirlooms. 4 Remember you can always upgrade in the future. If your fiancé couldn’t afford your dream ring, keep in mind that women upgrade their wedding rings all the time. And once a few years have passed (and trends have begun to change), you and your partner will likely feel less emotionally attached to your ring’s style, making conversations about swapping it for something different a little less fraught. 5 Don’t forget about what your ring represents. 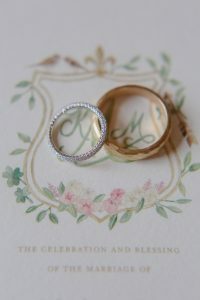 A ring is a gift meant to show your partner’s love and commitment as you begin your lives together. Thinking about how much your intended loved choosing it for you, or what he or she said when presenting it to you, might help you keep things in perspective. Most jewelry stores will allow the purchaser to return or exchange an engagement ring, but this policy will quickly come with a time limit. If you think exchanging the ring is an option, don’t sit on your feelings for two months before working up the courage to tell your fiancé you don’t like the ring.